Forty-nine people have been killed and 48 people hurt after gunmen stormed two Christchurch mosques in the worst terror attack on New Zealand soil. One man in his late 20s had been charged with murder so far, Bush said. Anxious family and friends are pacing outside Christchurch Hospital, waiting for news of injured loved ones. I can't believe it," he kept saying. A social worker eventually helped the man get a cab - although there are long lines as many of the taxi drivers are from the affected community. None of the four people arrested had been on any terrorism watch, including in Australia, the Police Commissioner said. Earlier Prime Minister Jacinda Ardern said 10 were killed at Linwood and 30 at the Deans Ave mosque near Hagley Park. She said a further 20 people were seriously injured, while Christchurch Hospital has just confirmed 48 people suffered gunshot wounds. Four people were arrested - three men and one woman. Witnesses have described the horror as it unfolded, some of which was filmed by an attacker, including a man who told Christchurch Star, he crawled to safety amid the carnage of the shooting. A Christchurch Star reporter saw a dead body lying near Al Noor Mosque. There were also reports of a third active shooting unfolding outside Christchurch Hospital. Australian Prime Minister Scott Morrison has confirmed an Australian-born citizen has been taken into New Zealand police custody over the Christchurch mosque shootings. A number of IEDs that were attached to vehicles in Christchurch have been defused. 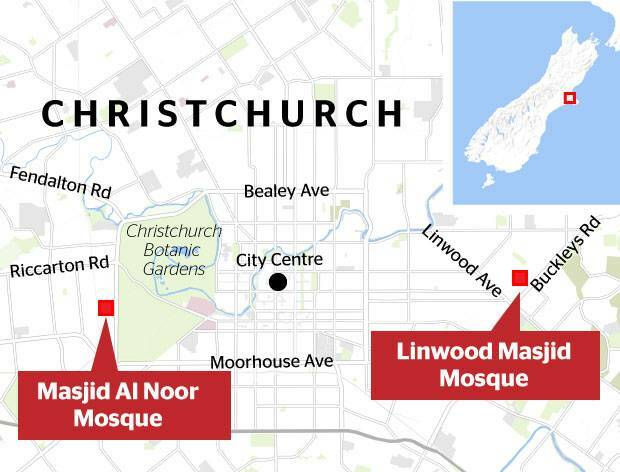 He confirmed police were dealing with two shootings at two mosques in Christchurch, one at Deans Ave and one at Linwood Ave.
Those locations remain locked down. "We can confirm there have been a number of fatalities. "So far, four people, three men and a woman, have been taken into custody after being apprehended by Police. "We are speaking with those people. When asked if it was true that a person had been arrested wearing wired explosives, Bush said that person had been "made safe." Police are still treating the incident as ongoing and Christchurch residents are strongly urged to stay indoors and keep safe, and monitor the Police website and social media for further information. "We continue to utilise every possible resource to resolve the situation. "Police work with a number of agencies in preparation for events of this nature and we have plans and procedures in place which we are following. "We are receiving assistance from NZDF, Ambulance, Fire and Emergency New Zealand, and wider Government. "At this stage we will not be discussing the offenders’ possible motivations or the causes of this incident. "We have asked all mosques nationally to shut their doors, and advise that people refrain from visiting these premises until further notice. "The lock down of schools through Christchurch has been lifted." Addressing a media conference in New Plymouth earlier today, Ms Ardern described the events in Christchurch as this one of New Zealand's darkest days. Police issued an update just before 5pm saying that due to the ongoing situation schools across the city remained in lock down, but by 5.50pm it had been lifted. The gunman who attacked the mosque appears to have posted the shocking killing spree on Facebook. Nineteen seconds of footage was posted on Christchurch Police Check Points page. The page is not connected with the police. The appalling footage which was filmed with a GoPro shows people lying on the floor as the gunman shoots them with an automatic weapon. The video was taken off the site soon after it appeared. One of the gunmen is believed to be an Australian who has written a 37-page manifesto declaring his intentions. "I saw people drop dead in front of me." A man, who would only be known as Nour, who crawled to safety amid the carnage of the shooting has told of what happened. A person who had been told by a man in the mosque said: "A gunman came in in with an automatic gun and opened fire, spraying it from side to side." Police at the shooting in Christchurch. Photo: Supplied via NZME. There were also reports of a third active shooting unfolding outside Christchurch Hospital, and the Guardian reported police as saying there was a bomb on Strickland Street in Christchurch. "The bomb is located inside a beige Subaru that has crashed on Strickland Street, about 3km from the Al Noor Mosque where the shooting took place," the Guardian reported. "You're not safe here, there's a bomb in that car," a senior police officer told reporter Eleanor Ainge Roy earlier today. Meanwhile, people gathered outside the police cordon at the scene of the shooting appear connected to the mosque. Many of them were crying. People were slowly starting to emerge from within the cordon, very distressed. Several witnesses were the escorted away from the scene and the cordon by police officers. One person told a Christchurch Star reporter that police had told them there aunt had been shot dead in the mosque and another person said police had told them their father had been shot dead. A gunman was earlier reported as being in the is in the Botanic Gardens, but a woman in the Botanic Garden's Ilex cafe said they had been told the gunman was near or at Christchurch Hospital - but this remains unconfirmed. People in the cafe had to move to the back of the building, the doors had been chain locked and no-one could sit near the windows. There had been a conference at the cafe. "No one has come in panicked," she said. Police earlier surrounded the Botanic Gardens. Mohamed Warsame said his brother who is 26 and his mother were in the mosque and they were safe. His brother said the police evacuated him and his mother in a van but they are safe. People who are at the mosque say that a younger child has died and they understood the child was aged 4-5.
here are reports a person who was driving past was shot. Linwood Dental Centre Dentist Peter Payne said he had notified the police after hearing about 20 shots fired in the space of five minutes on Linwood Ave at 1.45pm. The dentist was in lockdown with two patients inside. "We've had the armed defenders squad in and out to check the building and secure the area. We are locked in here and not allowed to move out." "We haven't seen anyone suspicious." He said he hadn't heard any gunshots since. Police thanks the public for their cooperation and will provide further updates to keep residents informed. A Christchurch Star reporter saw a dead body lying close at Palazzo Lane near the mosque. The body's face has been covered with clothing. Carl Pomare, was driving past and saw it unfold, and confirmed there were fatalities. His co-workers had to deliver first aid. It was half an hour before ambulances could get in because they could not secure the area and it was not safe, he said. She was unsure if they were gunmen. Moments earlier she heard what she thought was gunfire. A report on Twitter said about 20 armed police were earlier clearing buildings in Linwood, across from Eastgate Mall. A roadblock was being set up around the Aldwins Rd/Linwood Ave intersection. A witness said he saw a man in handcuffs being led away by police. The team is in Christchurch to play New Zealand in the third cricket test starting tomorrow. A witness who was outside the mosque said he heard shooting start at 1.40pm. He saw people running outside. The shooter carried on shooting for 10 to 15 minutes. His father was inside the mosque and wounded and is currently in the ED. He did not want to be identified. But they were worshippers at the mosque. Mario Villavarayen, strength and conditioning coach of the Bangladesh cricket team said: "The players are shaken up but fine. I spoke to one of them shortly after [the incident]. They didn't see anything but heard gunshots. They were at the ground [Hagley Oval] and just started running. "The coaching staff were all at the hotel. The players just started running when they heard the shots. I don't know how many [shots] there were. This happened at about 1.45pm." Media at the scene were earlier told to move because it was unsafe. The public were earlier warned not to attend Christchurch Hospital unless it’s an emergency. All appointments have been cancelled this afternoon, and no staff or patients are to enter or leave the building. Deans Ave was earlier closed between Moorhouse Avenue and Riccarton Road. Road users are advised to avoid the area. In Cathedral Square, a police officer asked for everyone to make their way home immediately. The police officer said there had been an incident and students should go straight home.